Designed to be more wave piercing and a drier ride. This Daring new designed boat is not just stylish but also one of the most smoothest boats on water. Accommodation: Spacious Outer deck area, 2 spacious cabins and 1 washroom in lower deck. The second model in the Coupe range represents evolution of the Astondoa shipyard towards more modern, sporty, original, and bold aesthetics. 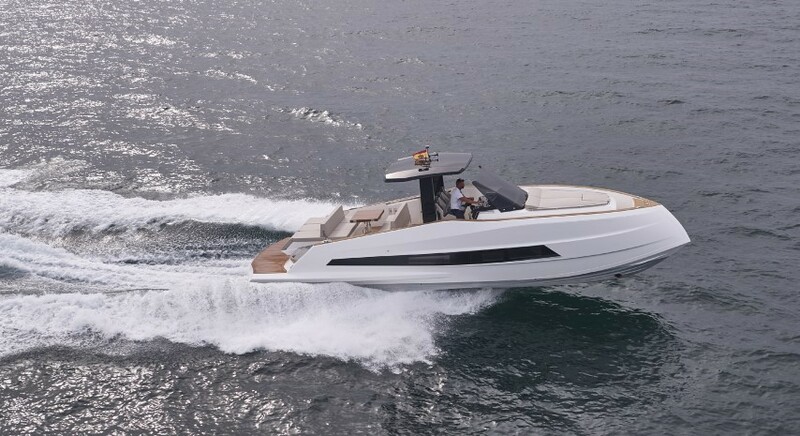 The 377, is designed for those who love sports cruising and are looking for a more exciting experience on board. With an exclusive bow design and its unique spaces the 377 Coupe is superbly finished. Its T-top yacht with a walk-around design around the entire boat with only one step. it has three different areas: two sunbeds, at the bow and stern, and a third half-length area, which connects the galley and fridges space with the triple pilot seats in front of a modern helm station with harmonious and modern instruments with multi function touch screens.Also very useful store box under the stern sunbed for water toys. In the interior of the 377 we find the lounge/cabin with its refrigerator and TV/Entertainment system, completed with a spacious washroom with head/shower which is exceptional for its length, it also consists of a second cabin with two beds.